Freiburg have been the Bundesliga's most clinical team so far this season. Football is all about taking your chances, and if there's a Bundesliga team who excel in that regard it's Bayern Munich, right? Maybe Borussia Dortmund? No, it's SC Freiburg! Record champions Bayern and Dortmund's exciting talents have created far more "big chances" — that is clear-cut scoring opportunities — this season than Freiburg, but it is the Black Forest oufit who are the German top-flight's most ruthless side. Christian Streich's men have had only 41 "big chances" but have converted 25 — that's almost two thirds of them (61%) — into goals. Bayern (45% "big chance" conversion) and Dortmund (47%) could clearly learn a thing or two from their top-flight counterparts. If the title-winners had been as efficient as Freiburg, they would have scored 13 more goals than the 39 they have netted from their "big chances". Dortmund would have had 14 more, taking their tally to 59. Where Bayern have excelled is in creating goals from seemingly very little. Carlo Ancelotti's men have scored 40 times from situations not categorised as "big chances", a testament to the breathtaking individual talent within Bayern's ranks. 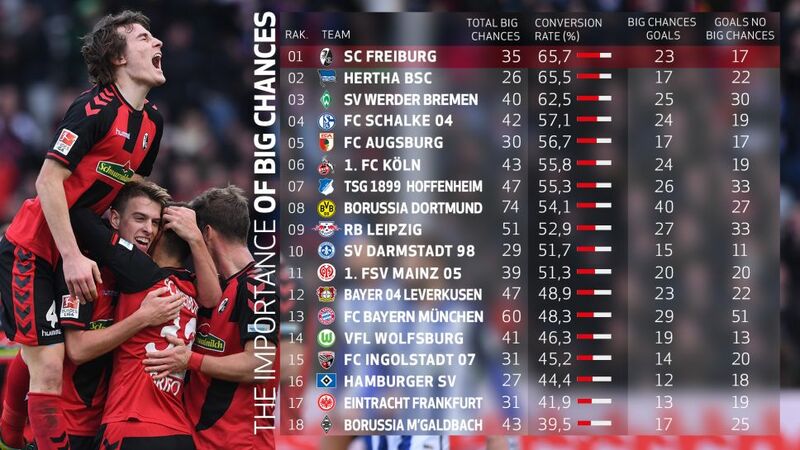 Hertha Berlin and Augsburg also created very few "big chances" — 39 each — but both converted a handy 56%, the second-highest ratio behind Freiburg. And the teams that left their fans with their heads in their hands most often? Wolfsburg and Frankfurt, who failed to find the net with nearly two-thirds of the "big chances" they were presented with (37%). Click here for all the fixtures and results!